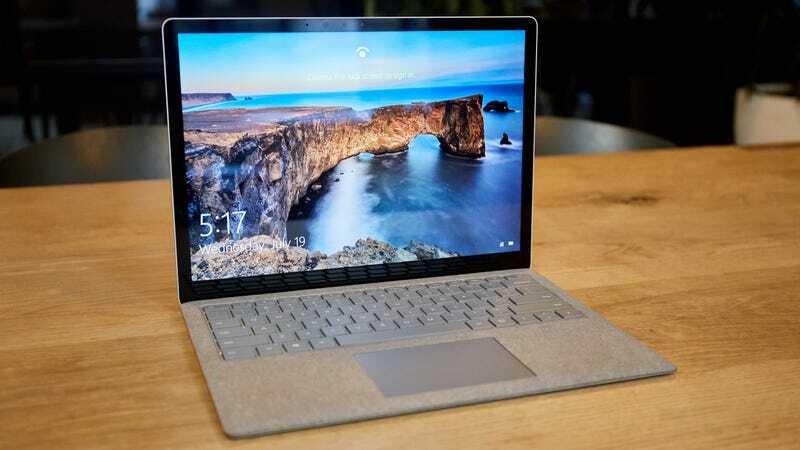 Today, as noted by Windows Central, Microsoft launched a cheaper version of its gorgeous Surface Laptop. This new version will retail for $800—a full $200 less than the previously cheapest Surface Laptop. If you’ve wanted a full-blown, lower-cost computing experience in the Surface ecosystem then this is the machine for you. But you might do a double take. While it is definitely the cheapest Surface computer you can currently get (there’s also an $800 Surface Pro tablet—but it doesn’t include a keyboard or stylus), it, like the $800 Surface Pro, is a little hamstrung. Both devices have 7th-generation Intel Core m3 processors inside, a measly 4GB of RAM, and a virtually anemic 128GB hard drive. For comparison’s sake, right now you can get a Lenovo 720 with a 7th-Gen Intel Core i5, 8GB of RAM, 256GB hard drive, and a touch screen for the same price, and an 8th-Gen version is just $50 more. Yet Microsoft isn’t the first company to charge crazy money for an underpowered computer with last generation’s hardware inside. Apple currently charges $1,300 for a Macbook with a 7th-Gen m3 processor. That laptop at least includes 8GB of RAM and 256GB of storage—but it’s still an outrageous price for a 7th-Gen m3 machine. I’d be grumpier about this, but Apple has had its “Apple tax” for over a decade and people have happily paid it because they felt the design of an Apple laptop was worth the premium. So I’m actually sort of heartened to see Microsoft value its own designs enough to have a Microsoft tax, and at least that tax isn’t as steep as the one Apple commands. Comparatively this new Surface Laptop feels, almost, like a bargain.